My Father's Day gift came early last week. My oldest boys made me proud. Long story short, we were given a faded yellow Kawasaki Jet Ski last year, the only problem being that it didn't run and it was located on a dock across the county. There was no good way to get it on a trailer at the dock, so the only option was to put our Waverunner in the water at a nearby ramp, tow the dead ski back to the ramp, and load both up on separate trailers. This project I had been putting off until we were given the ultimatum to either get it gone or give it up. I was ready to give it up when Bobby, 19, and John, 17, said they'd handle it. Really? Figure out the logistics of moving and towing and loading and trailering? They wanted to get the old ski running, and said they'd figure it out. Aside from advising against doing it on a weekend (busy ramp and waterways) and safely rigging the trailers and tow vehicles, I turned it over to them. When I came home from work last Wednesday night there was a dead yellow ski in the driveway with parts strewn around and John stretched out underneath it. And the next day I got the attached video via iphone. The darn thing was running. Tomorrow it gets a sea trial. I think those boys might be learning something. Last day of School exhortation~ Cry the Gospel with your Life! Today is the final day of school. Our youngest three children finished the year with Mass and awards this morning. Our children's Praise Band at St. Raphael sang the Tom Booth song "Cry the Gospel with your Life." I really can't sing the song all the way through without tears. To me it encapsulates all that we should be. It is a fitting exhortation for the summer, and for the rest of our lives, children and adults. When I googled the name of the song, a write up of Blessed Charles de Foucauld came up. Prehaps he originally coined the phrase to describe his philosophy of life after a 180 degree transformation. Take a minute and listen to this amazing and inspiring song and renew your commitment to Christ and His Church. so in the Father they'll believe. to every person that you meet. We are holy we are strong! Be holy, cry the gospel with your life! cry the gospel with your life! He had a prolific pen and his writings best illumine his holiness. Although he was not a man of great scholarship, his works reflect deep insight and knowledge of the Scriptures. In writing about the mysteries of humanity's redemption, Ephrem reveals a realistic and humanly sympathetic spirit and a great devotion to the humanity of Jesus. It is said that his poetic account of the Last Judgment inspired Dante. It is surprising to read that he wrote hymns against the heretics of his day. He would take the popular songs of the heretical groups and, using their melodies, compose beautiful hymns embodying orthodox doctrine. 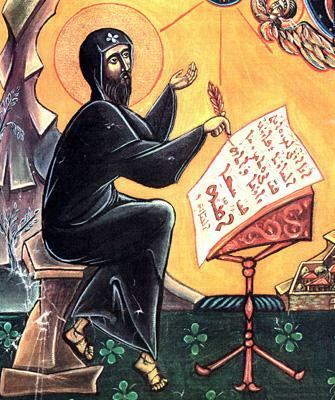 Ephrem became one of the first to introduce song into the Church's public worship as a means of instruction for the faithful. His many hymns have earned him the title "Harp of the Holy Spirit." From AmericanCatholic,org "Saint of the Day"
My six year old icing my cake! My phone beeped at 7 am this morning and has been beeping off and on all day with Facebook messages. How amazing to hear from so many old and new friends. Facebook makes it so easy to stay in touch and to reach out to people we would never buy a card for, find a stamp and put in the US Mail. I am so grateful to so many people who have been part of my life journey. Some going back to St. Albert Grade School, Alter High School, University of Dayton, early work career in Cincinnati and all my Florida friends! Each of you have blessed me. You all have shared the ups and downs and made each day a little brighter. Life is a gift from God and all the wonderful people He puts in our path are the wrappings on the gift! God Bless you all and Celebrate Life! Happy Birthday to the most wonderful wife and mother a man could ever wish for. 25 years of wedded bliss we celebrate tomorrow! Happy Birthday Julie!!! Hope you have a wonderful day. Happy Birthday, Julie! Look forward to hanging out with you and Bob again soon! Thanks to all for the well wishes! My phone has been beeping non-stop! HaPpy BirThdAy - my friend! I hope you have a blessed day. Happy Happy Day Julie! Sending a big birthday hug your way! happy Birthday Julie, have a great day! Many more, Julie - have a great day! Jerry Schmitz congrats to Joey! Happy happy day! Wishing you continued blessings on your birthday and always! Happy B-Day, Julie! I hope you're well and you have a wonderful day! Hey... it's a great day for a birthday! Glad it's yours. Have a blessed and happy one! Have a Blessed Birthday, Julie! Have an awesome birthday, Julie!